A comprehensive collection of some of the most popular humorous scenes from the latest Tamil movies featuring prominent comedians played back-to-back. Siripoli is a 24 hours Tamil comedy entertainment TV channel. 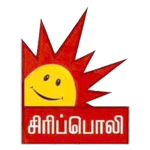 Suscribe to YuppTV to watch Sirippoli TV live. It amazing, fun yet entertaining TV shows such as Athanium Sirippu, Eppovaume Santhosam, Siripu Mathapu, Vanga Sirikalam, Aduthaduthu Sirippu, Sabash Sariana Sirippu, Sirithu Vazhalavendum, Adada Enna Sirippu, Sirippu Mazhai, Idaividatha Sirippu to name a few are worth to watch out on sirippoli tamil tv channels live. Sirippoli TV is Available in United States, Australia, United Kingdom, Canada, Europe, New Zealand, Saudi Arabia, Qatar, Middle East and UAE.